Sometimes it seems impossible how much you can learn, discover, experience and see in just two weeks. Probably, most of the students participating in the MS FSCC Summer School 2018 in Malaysia had the same feeling. 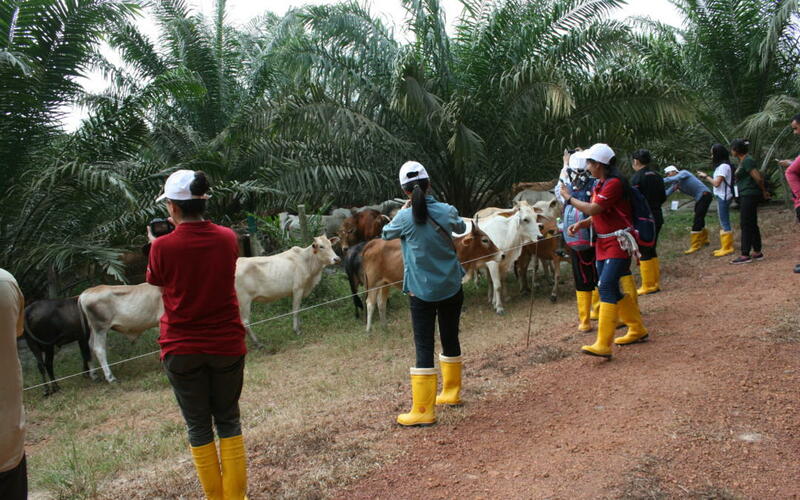 The Summer School 2018 was held already for second time, this year under the topic “Transitions towards sustainability – oil palm and cattle integration” at UPM in Malaysia with participating students from more than 10 countries all over the world. Included in the tough but well-timed program were seminars held by experts from Asian and European countries on the topics of sustainability and climate change (CC), oil palm farming and livestock production, visits in an oil palm company and oil mill and a one-week-stay and field work in a rural region not far from the capital of Malaysia, Kuala Lumpur. During the stay we visited several oil palm plantations to measure parameters like biodiversity, soil texture and animal wellbeing as well as we interviewed farmers and companies about their farming techniques, especially regarding cattle integration. During discussions with farmers and fellow students from other parts of the world, it was interesting and also challenging to see that the matter of climate change and sustainability is not as present and well-known for everyone as it might seem for an environmental student from European university. written by a student Hermine Zimmermann on behalf of Agrinatura network as a partner within MS FSCC project.